The wicked queen from Snow White would have just LOVED our house. There are mirrors everywhere, and I mean everywhere. Forget the “Mirror, mirror on the wall . . .” hubbub. At our house it’s more like, “Mirror, mirror on the door, above the fireplace, as a back splash, and oh look – the entire west wall of the basement. . . “. I think our home’s builder may have consulted Narcissus himself when drawing up the blue prints. Because you can’t swing a hair brush in our house without hitting at least three mirrors. Welcome to Operation Reflection Obliteration as we embark on some of our final main floor updates while trying hard not to ensure seven years of bad luck along the way. Why now? 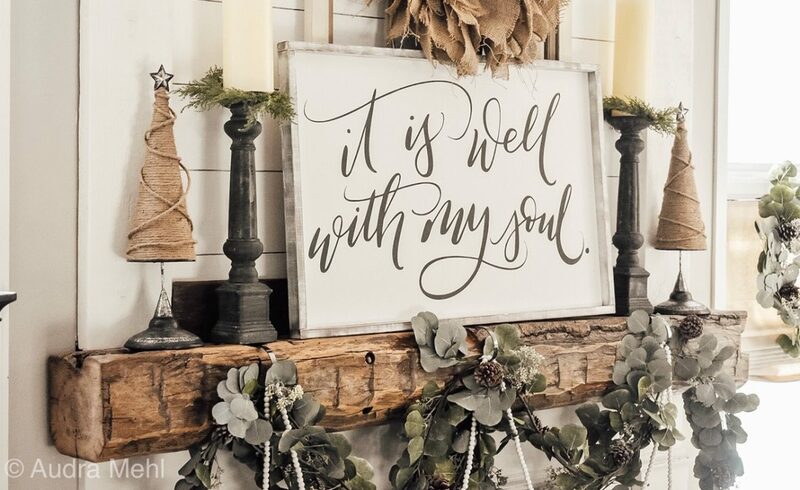 Because, we are in the midst of preparing our home for it’s close up, it needs to be picture perfect by the first weekend in November for the Homes for Holidays tour showcasing our farmhouse chic shop, Grace 1972, along with the sweetest entrepreneurs in the whole wide world from Gathered Rentals & Events and Blue Barn Florals. I am so excited to collaborate with these women and have a creativity explosion within my very own home! So yes, that is our pantry and those are mirrors. I rarely photographed my home from this angle because those mirrors made me look like I was living in a well decorated fun house. Of course, I did what we all do when we live in home with a few outdated finishes. I lived with them. Pretended it wasn’t there and just went on with life. The first thing to go was the mirrored pantry doors. Matthew and I had originally planned on barn doors as our update of choice, but after a bit of research we decided that the opening was too challenging. We’d have to mount the brackets inside due to the shelving above and have the barn doors overlap. The hardware was also super pricey. And since we probably will sell this house someday, we didn’t think it worth it to put $1,000 doors into our kitchen pantry doors. Therefore, we went with solid oak mission style. These are the style we went with when we replaced all of our oak interior doors and figured it would bring cohesiveness to the home to utilize the same design and black stain. Are you ready for the big reveal? Ta da! What do you think? $300 and one afternoon later we were no longer watching ourselves eat our dinner in those mirrors. We just love it! And then, of course, I was suddenly inspired to tackle the built in hutch. Again, our update of choice was to replace the back splash with subway tile but we haven’t yet invested in a wet saw and so have put that on hold. I also would prefer a wood counter top instead of the granite but Matthew talked me out of it – it doesn’t gain anything and this isn’t our forever home. Black granite isn’t my style but we decided to roll with it. So much so that I decided to use the black granite for inspiration. And besides? Who needs a wet saw when one has a paint brush and ain’t afraid to use it? The black is a great backdrop to display white pieces, and woods and whites are a very clean and trending look. The black granite doesn’t even bother me as much as it used to as now the color scheme really ties together. It’s really exciting to personalize a home and make it your own and completing these projects was very satisfying. That mirror is now history. I can’t wait to show you guys the final result! On a more somber note, although it was on my to do list to sit down and write this blog post this weekend about all of our home updates to correlate with an article The Forum is running on Grace 1972 tomorrow, our family has been dealing with the loss of our dearest and oldest pet, Dolly. And I just can’t sit down and write about home updates without taking a moment at my keyboard to honor her gentle soul with a brief little tribute to her sweet life. Dolly has made several cameo appearances on my blog since I started it and my eagle eyed readers have always commented about her and how much they enjoy seeing little surprise glimpses of her show up in my blog photos. She has also been showcased on Grace 1972’s Instagram and Facebook page in photos of products or style ideas now and again. Because Dolly is a part of our family, her gentle presence is the truest meaning of home, more so than any throw pillows, paint colors or project updates. For home is love, and snuggles and joy. Home is caring for one another, supporting one another in good times and in bad, through the smiles and through the tears. And trust me, Dolly saw it all. She’d moved with us four times, she was there through my divorce, and there when I remarried. This loving little fluff ball quickly became as important to Matthew and Karrly as she was to Sophie, Morganne and me. Everyone loved “the doll” – from her kitten days to her frail and failing elderly years, Dolly was always so incredibly loved. Dolly was love. And love is home, and that is what Dolly was to our family. She was home. For 13 years I’ve never lived in a home that Dolly wasn’t a part of, and it feels cold and strange without her among us. And so, in all of my home design photos, I never moved Dolly if she was “in the way” for a picture. She was more important than any material object I was photographing. For 13 years she was an incredibly special part of our family. And on Friday afternoon, with her head in my hands, she slipped peacefully off to heaven as I sang to her . . . and cried. She’d been ill for some time but had quickly declined and we could not bear to see her suffer another day. Her last few days were spent being snuggled and loved. We made her as comfortable as we could as we said our goodbyes. Even though it was so very very hard to say goodbye today, I will be forever grateful that my answer to that question 13 years ago . . .
. . . was yes. Just had to say, I knew Dolly from the day she was born. The only white and black kitten in a new litter born in an old wicker baby bassinet basket in the barn. I was overjoyed to see a spotted Kitten. A few days later, she’d fallen out of the “nest” between the wall and basket, so I plunked her back where she belonged. Mama was very wild, so I paid very little attention to them for fear of her leaving them. There were 6 kittens in that pile. About a week later, I discovered something bad had happened, and the mother and kittens were gone. On my daily trip to the barn, I found Dolly – maybe 6 weeks later – laying in the grass in front of the barn. She was so emaciated, she had 3 paws in the grave. I quickly went into action to save this beautiful fluff ball. She quickly gained strength and weight and became the delight of the farm. The rest of her days were that of a Princess Thanks to you and your family Audra. I will always hold her memory in my heart, as will anyone that ever met her, because she was a gift from God, and her gift was simply love. Beautiful redo! Matt did a fab job on those doors! And painting the mirror was a great idea too! Wow. Your words about Dolly were so touching.